EnviroSim is pleased to announce the latest issue of “The BioWin Advantage” e-tech newsletter. This release discusses Simulating Air and/or Mixing Shut-Off in a Bioreactor. In this issue we will be exploring how to simulate air shut-off (eg. during construction or storm events etc) as a means for protecting against solids washout, or to retain solids in one zone of a flow-through system for some other purpose (eg. in-basin MLSS fermentation). The “trick” for doing this is to use BioWin’s Sequencing Batch Reactor (SBR) element where a “normal” bioreactor typically would be used. We will look at the basic requirements to set up an SBR configuration that allows us to simulate the situation where the aeration tanks will be fed but not aerated for a 24-hour air shut-off event. Without the mixing provided by aeration, the solids will settle in the aeration tank. We will then use this configuration to investigate the level of effluent breakthrough of ammonia (or BOD), and to determine what happens when the air is turned back on after the event. It is worth first revisiting how a typical batch-fed SBR might be simulated in BioWin. SBRs have a wide application in wastewater treatment and BioWin uses a comprehensive quasi two-dimensional modeling approach to most accurately represent these systems. 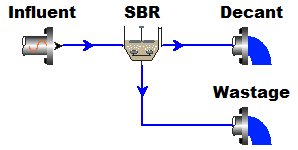 SBRs are typically operated in batch mode with aeration and settling occurring in the same tank. 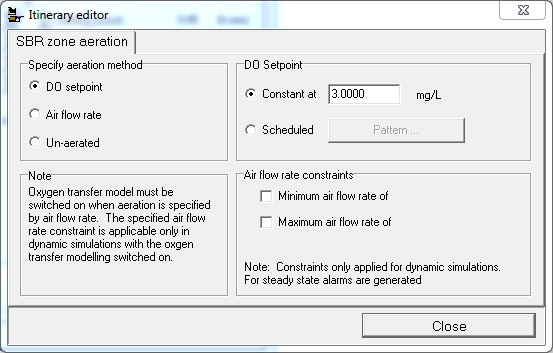 A basic SBR configuration for simulating a pilot-scale SBR system in BioWin is shown below. 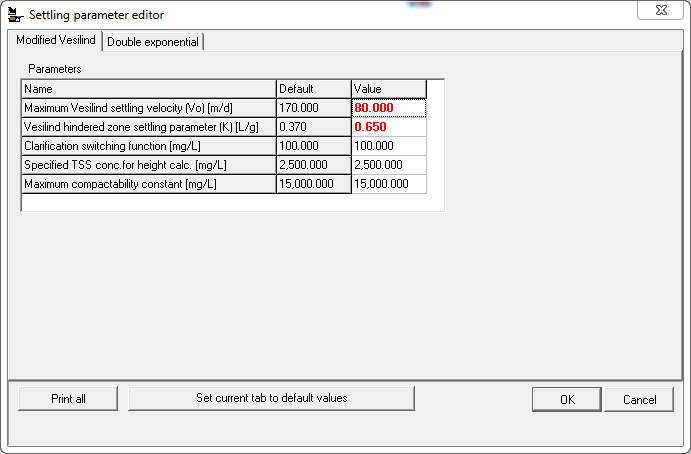 Double clicking on the Influent Element shows us that the Input Type is set to Variable. 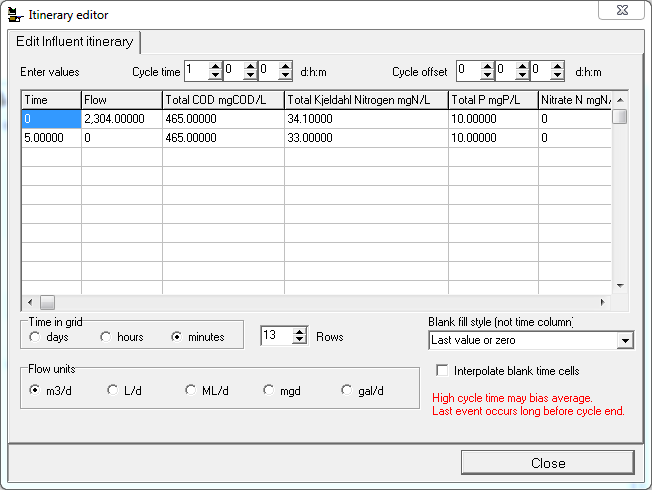 If we click the Edit data button, BioWin’s Influent Itinerary opens and we see that during the first 5 minutes of a 1-day cycle, an instantaneous flowrate of 2,304 m3/d enters the SBR. This translates into a total flow of 8 m3/d (i.e. 2304 m3/d x 5 min x 1 d/1440 min x 1 cycle/d). BioWin also allows SBRs to be configured to have continuous flow. In this case, feed will even enter during settle and decant mode. 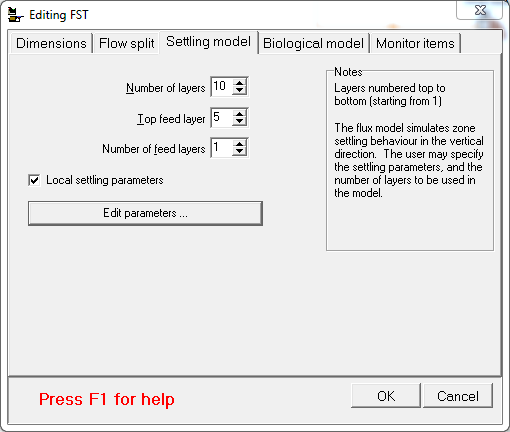 Two possible ways this can be achieved is by setting the Input Type in the influent element to Constant, or by specifying Variable with a 24-hour flow pattern. 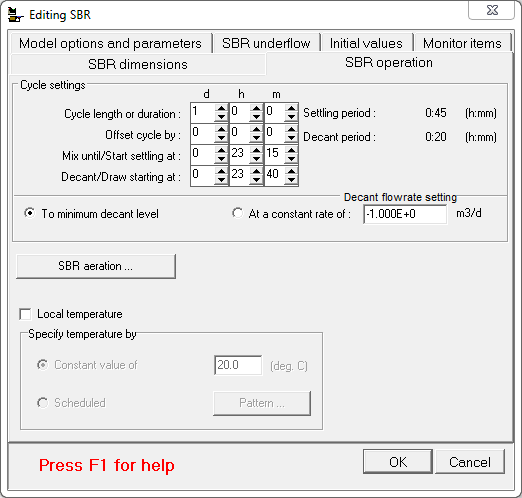 Double clicking on the SBR element allows us to input the cycle time and design characteristics of the SBR. On the SBR dimensions tab we specify the size of the tank (i.e. 10.5 m3) and the minimum decant level (i.e. 20% of full = 0.2 x 10.5 = 2.1 m3). Based on the influent volume addition of 8 m3 the total operating volume of the SBR is 10.1 m3 (i.e. 8 + 2.1 m3). It is important to note that if the operating volume exceeds the SBR volume, the SBR will overflow and you will have flow coming out even if you are not decanting – possibly containing significant amounts of mixed liquor solids! 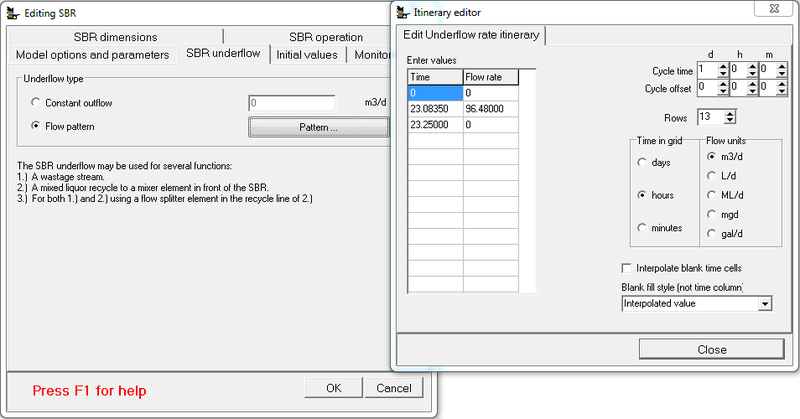 On the SBR operation tab the cycle times, outflow and aeration information are input. In this example, the cycle length is 1 day (to have multiple cycles in a day we simply shorten the cycle length). The SBR reacts (i.e. mixes and aerates) until 23 hours and 15 minutes as specified by the Mix until/Start settling at time. This also corresponds to a settling period of 45 minutes. The SBR starts to decant at 23 hours and 40 minutes corresponding to a decant time of 20 minutes (note that BioWin allows solids settlement to continue during the decant phase). You can select to either input a specific decant flow rate, or have BioWin calculate the required flowrate to achieve the minimum decant level during the decant phase. In this example, we have selected the latter option; so 8 m3 of liquid volume will be decanted (i.e. 10.1 – 2.1 m3). 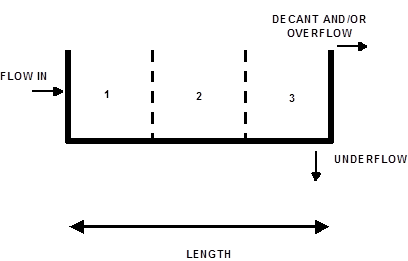 The outflow is determined based on the time specified for the decant period (i.e. outflow = 8 m3/20 min x 1440 min/d = 576 m3/d). This flow will be displayed during the decant period when the cursor is hovering over the outflow pipe. Clicking the SBR aeration button on the SBR operation tab opens the SBR zone aeration dialogue box. A constant DO set point of 3 mg/L is specified. It is important to note that despite the fact that a constant DO set point is specified, BioWin does not aerate SBRs during the specified settling period. The simplest way to achieve solids wasting from a BioWin SBR element is via the SBR underflow tab. In this example, we will only have an intermittent waste flow, so the Underflow type is set to Flow pattern. Clicking on the Pattern button opens the Underflow rate itinerary. This itinerary allows you to specify when the wastage event will occur (i.e. during react or during settle). In this example, a 10-minute wastage period has been specified starting at 23 hours and 5 minutes and lasting until 23 hours and 15 minutes (i.e. MLSS is wasted just before settling commences). A total volume of 0.67 m3 is wasted (i.e. 96.48 m3/d x 10 min x 1 d/1440 min x 1 cycle/d). 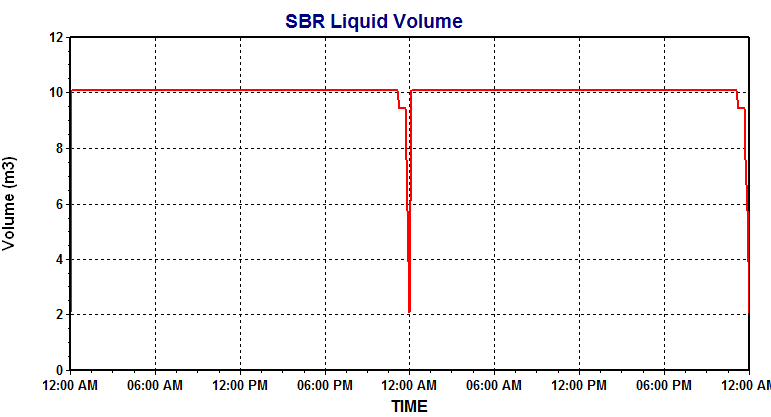 When simulating SBRs it is a good idea to plot the SBR liquid volume in the BioWin Album to ensure there is no unintended overflow (i.e. the liquid volume remains below the tank volume) and to verify the wastage and decant volumes and cycle times. In the example below, we can see the volume was maintained at the expected level for most of the day, takes a slight dip when wasting occurs, and then drops away rapidly when the decant phase occurs. The Width parameter on the Dimensions tab is used to calculate the horizontal length of the SBR; flow moves along the horizontal length from the inlet to the outlet. The horizontal length is divided into 3 equal-length subsections. The vertical depth of each of the three subsections is divided into 10 equal-depth layers resulting in a total of 30 cells in the SBR. When we plot a parameter at the outlet of an SBR in BioWin, we are plotting the response in the top layer of the last (3rd) subsection of the SBR length. When we plot a parameter in the SBR underflow, we are plotting the response in the bottom layer of the last (3rd) subsection of the SBR length. This is especially important to remember when looking at solid concentrations. When the SBR goes into settle mode, the solids in the upper section of the SBR will decrease while the solids in the lower section of the SBR will increase. 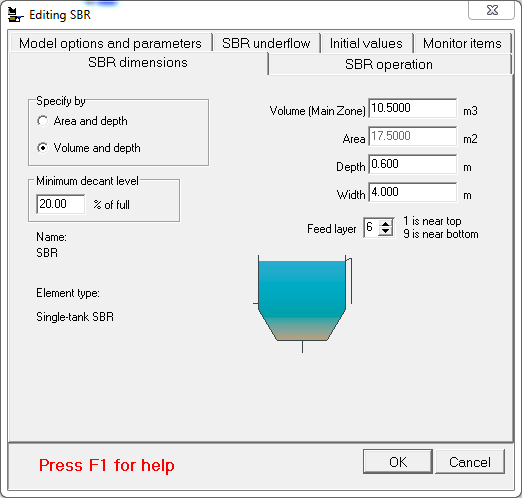 The decant flow rate and decant period in the SBRs is set to allow the maintenance of a near-constant tank volume as shown on the SBR Operation tab below (i.e. a decant flow rate of 1 m3/d and decant period of 1 minute). The underflow rate in the SBRs is set to zero to ensure no wasting and the maintenance of a constant volume. BioWin requires a pipe connection to the underflow, so the underflow is connected to an output element labelled “Not Used”. Breakthrough of BOD or ammonia may result in effluent concentrations that exceed compliance limits. Effluent limits are often based on composite samples. 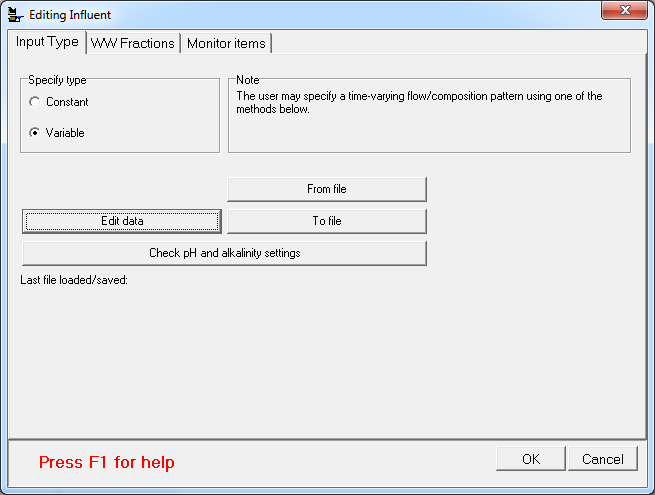 In the BioWin file the effluent ammonia concentrations are summarized on the first tab of the BioWin Album in terms of an instantaneous concentration, a flow weighted daily composite concentration, and a flow weighted monthly composite. From the State variables group select Ammonia N.
From the Elements group select Effluent to expand the list and choose Effluent. 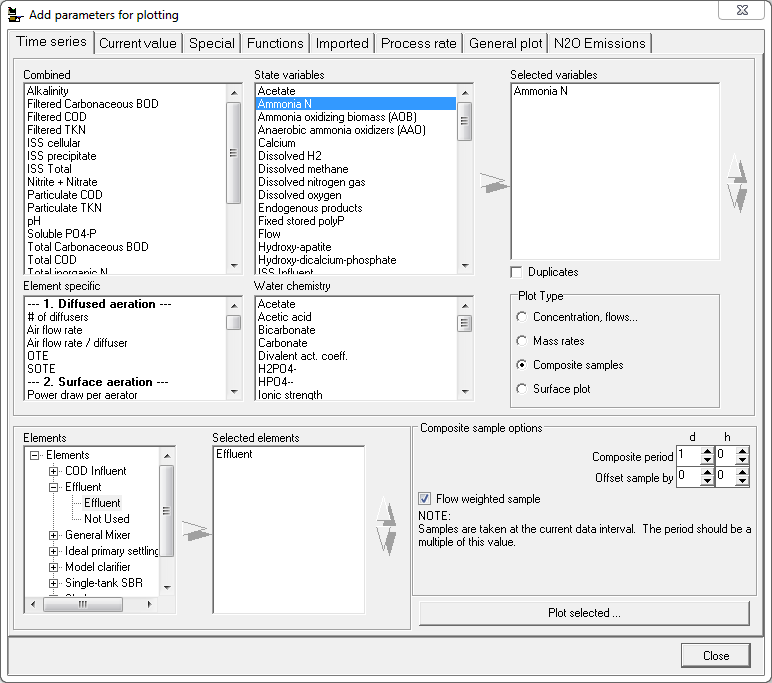 From the Plot Type choose Composite samples to display Composite sample options. From Composite sample options select a composite period of 1 day (i.e. a daily composite) and check the flow weighted sample box. Click Plot selected… and choose the Point series type. Click close to exit the dialogue box. Note that monthly composites are calculated by choosing a 30-day composite period. To establish a steady state condition prior to the shut down event a dynamic simulation was run for 25 days starting from seed values. The establishment of steady state in a 25-day period was specific to this example. It may be necessary to run multiple 25-day runs (i.e. the first 25 day run starting from seed values, and subsequent 25 day runs starting from current values) to establish steady state in other examples with different operating parameters. To simulate ‘turning the air off’ a second dynamic simulation was run for 35 days starting from current values. During this simulation, the system runs along for 29 days in “normal mode”, and then on the 29th day “air goes off” and the solids in the SBRs settle to the bottom of the reactor. The BioWin Album contains many charts that are useful for interpreting the response of the system. First, let’s look at the third tab of the Album which shows the MLSS concentration in each SBR. The MLSS concentration in the upper level of the SBRs declines when the SBRs go into settle mode on day 29. The Album tab also shows the MLSS concentration increasing in the lower level of the SBR as the solids accumulate in the lower level during settling. Next let’s look at the effluent ammonia and nitrate concentrations (1st tab). The charts show that the removal of ammonia and production of nitrate is stable for the first 28 days. On day 29 however, we see breakthrough of ammonia (i.e. the instantaneous ammonia concentration spikes above 25 mg/L) and the simultaneous reduction in nitrate in line with the “shut-down” event. Then on day 30 (and for the following several days) the SBRs return to fully mixed mode and the system comes back to normal. Based on the ammonia daily composite concentrations (orange squares), the system takes 2 days to return to ‘normal’. The BOD concentrations (summarized in the second tab of the album) follow a similar trend to that of the effluent ammonia. It is interesting to note that in spite of the very high instantaneous and composite ammonia concentrations associated with the air shut-off event, the monthly composite value does not get too high due to the very low concentrations achieved throughout the first period of the month. Finally, let’s take a look at the ammonia oxidizing bacteria (AOB) and nitrite oxidizing bacteria (NOB). The AOBs and NOBs settle out during the event but return to their ‘normal’ concentrations shortly after the event as shown by continuing the dynamic simulation for an additional 5 days. A longer shut down period (i.e. 48 hours). This is achieved by adjusting the Mix until/Start settle at time period to 28 days on the SBR operation tab. This results in 3 days of high effluent ammonia concentrations and increases the monthly composite ammonia concentration from 0.6 to 1.6 mg/L as shown below. Air shut down in only one aeration basin (i.e. zone 1). This is achieved by adjusting the Mix until/Start settle at time period in the SBR operation tab of the other SBR elements (i.e. zone 2 & 3) such that they go into settle one minute before decant (that is, these zones are essentially fully-mixed all the time). The chart below shows the ripple effect this has on the ammonia concentrations in the aeration tank. Turning down the settleability of the solids in the SBR zones. This adjustment could be made to account for the time required to dissipate mixing energy, resulting in some degree of MLSS washout from the bioreactors to the clarifier during the air shut-off event. As shown in the chart below, the MLSS concentration does not go to zero in the upper level of the aeration tank as before; that is, for most of the event duration, solids are flowing out of the aeration tank at between 500 and 1,000 mg/L instead of being fully retained as before. Using local settling parameters in the secondary clarifier (FST). In this edition of the BioWin Advantage, we used SBRs to simulate the loss of air and mixing in a bioreactor. We also learned how to show composite concentrations while charting the system response. In future editions, we will look at more complex shut down applications, and also continue to explore other features of BioWin. We trust that you found this technical topic both interesting and informative.Please feel free to contact us at support@envirosim.com (Subject: The BioWin Advantage) with your comments on this article or suggestions for future articles. Thank you, and good modeling. To subscribe to “The BioWin Advantage” please click here. The software license is leased for one year. The current lease amount is US $2,500 plus shipping costs for the first year, and $2,000/year thereafter. The optional BW Controller module is an additional US $500 per year. US $8,000 per copy plus shipping costs. The optional BW Controller module is an additional US $2000. •	Manual (including tutorials) in electronic form – users can print their own. BioWin users who exercise the Outright Purchase Option may upgrade electronically to the latest version for US $3,300. •	One year of telephone and e-mail software support. Please let me know if I can provide any further information.